Today tourists and locals alike are taken with the tiny Mediterranean isle. As for me, I had come in hopes of lightening a heart made heavy by the poor health of a family member. I was in the right place. As I made my way around Gozo (with Malta and Comino, the three inhabited islands of the archipelago’s seven) I savored each instant. The isle’s brilliant colors and odd geometry, both natural and man-made, kept me fully absorbed in the here and now. The names of the places I visited had a Lear-like lyrical quality: Xwejni, Calypso’s Cave, and Ggantija. Moments off the 20-minute ferry from Malta, my companions and I rolled along a dirt road through someone’s farm. We plowed through a field ablaze in shades of gold, with wild fennel, cape sorrel, marigolds, and mimosas all waving their yellow blooms. Rattling down the steep side of a glacial gash in the earth, I saw the remains of a Roman aqueduct far below, cushioned by velvety green foliage. The end of the road was a turquoise slit of Mediterranean in the cliff face, in which a lone boat was anchored, with a single swimmer slicing through the water. Gozo’s fiord-like ravines are but one of the landscape’s distinctive geological features. Others include a dramatic, massive natural arch, known as the Azure Window, an “inland sea’’ that is connected to the Mediterranean by a natural passage, and a vast network of caves. John Schembri, head of geography at the University of Malta, later told me that these are the result of Gozo’s unique ground surface, a combination of limestone above blue clay, riddled with fault lines, and the effects of erosion. The Azure Window is a monument to the forces of nature and time. The rock arch reaches more than 150 feet high. Each of its two supporting columns is a hefty 120 feet wide, mounted by a 300-foot ledge. Its “window’’ is almost the size of a football field. Winding our way north along Gozo’s coastline we turned a corner and collectively drew in our breath at an eerily beautiful sight. Amid mounds of perfectly sculpted sand on the sea’s edge was what appeared to be another window of sorts. Lying side by side and row by row were liquid panes of a glass-like surface, disjointedly mirroring the clouds above. We were witnessing a Xwejni Bay tradition. On a two-acre stretch of shore outside the tiny resort town of Marsalforn, there are about 300 salt pans, from which eight families harvest the mineral from the sea. Josephine Xuereb’s family owns just shy of an acre of salt pans, which she says were dug about 160 years ago by her mother’s family. “My father, who is more than 60 years old, tends the salt pans lovingly and with great dedication. The whole family is involved, and although it’s very hard and laborious work, it gives us great satisfaction,’’ Xuereb said. “The salt process is done only in summer, from May until September. Emmanuel Cini, Xuereb’s father, is also known as Leli tal-melh, Leli for short. “Melh’’ means “salt’’ in Maltese. “Every morning I am eager to go down to the salt pans,’’ Cini said. “As soon as I start down the steep road and get a glimpse of them from the top of the cliff, I am fulfilled. At sunrise, the pans compare with a piece of woven lace, particularly when the first salt crystals start to appear. Futility, in fact, was at the very heart of lore surrounding our next visit, around the corner from Xwejni and up a steep hill atop Ramla Bay, to Calypso’s Cave. According to legend and quite a few scholars, this was the abode of Homer’s nymph, where she held Odysseus captive for seven years. Ultimately, despite the magnificent setting and all her magic powers, Calypso could not change the fact Odysseus wanted to go home, a reminder that one’s will and desire can’t change destiny. 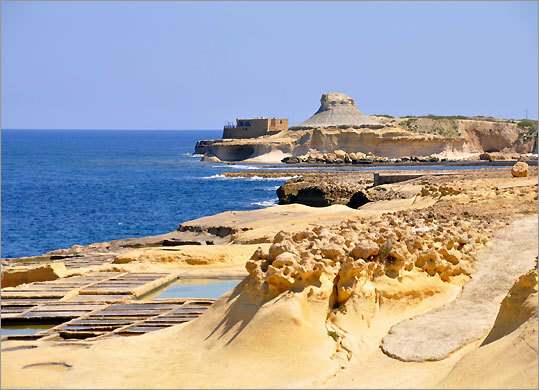 George Azzopardi of Heritage Malta says Gozo’s caves have been a boon to archeologists. The cave at Ghajn Abdul in the western part of the island yielded the earliest evidence of human presence in Gozo: pottery shards dating to 5000 BC. Other nearby caves also show evidence of human occupation and some are said to have been inhabited as late as the 1950s. The shelter of caves may have been a deciding factor in the location of one of Gozo’s most significant claims to fame, the Ggantija temples, believed by many to be the world’s oldest freestanding structures. The temples, which are set on a hill overlooking verdant Ramla Valley, date to 3600 BC, nearly a millennium before the pyramids. While archeologists can comfortably deduce why the site was chosen, explanations of how the temples were erected have proven less facile. Ggantija’s name is inspired by long-held local legend that only giants could have moved the megalithic boulders with which they are built. No consensus any more definitive has been reached. Like Ggantija’s genesis, or why illness sometimes strikes those we love, some mysteries are just impossible to solve. Meg Pier can be reached at nahantmeg@gmail.com. A 100-room hotel on the bay. Doubles $66-$106 per person. Built on Calypso’s highest point. Doubles $131-$171 per person. For one bedroom the daily price starts at $78 in January to around $113 in summer. Pizza and 16 varieties of ftira, a flat, crusty Maltese bread, in which a tomato paste spread is blended with tuna, vegetables, onions, and salad, $4-$7. Housed in an old boathouse. Entrees $20-$35. Romantic with French, Italian, and Mediterranean menu. Dinner for two $57-$226.